Traditionally wedding flowers were a unique combination of blooms put together to convey the hopes and dreams for the soon to be married couple’s future. A red chrysanthemum to say ‘I love you’, orange blossom to show purity, innocence and chastity, an arum lily would convey patience. Then, wedding bouquets favoured classic blooms, such as the rose, lilies, lisanthus or stephanotis in pure and simple whites. They were often elaborate designs, long and trailing, using delicate feminine blooms. Fast forward to today and just about anything goes. You can create a theme in pretty much anyway you choose. Beach wedding? Short wedding dress ✔️ Sandals/thongs/barefoot ✔️ Macrame backdrop ✔️ Gorgeous fresh tropical blooms. But what about if you want to have something truly different? 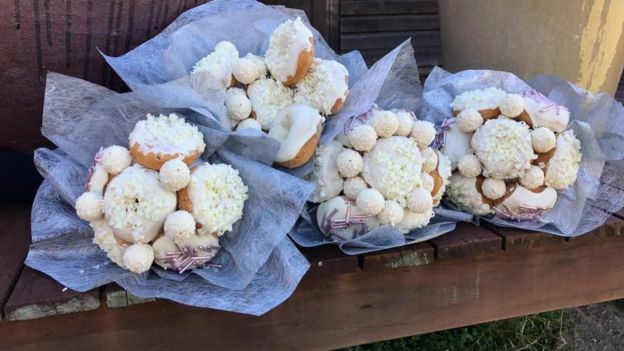 Like wedding bouquets that contain NO FRESH FLOWERS at all!!?? Now, I’m not talking about artificial wedding flower bouquets. 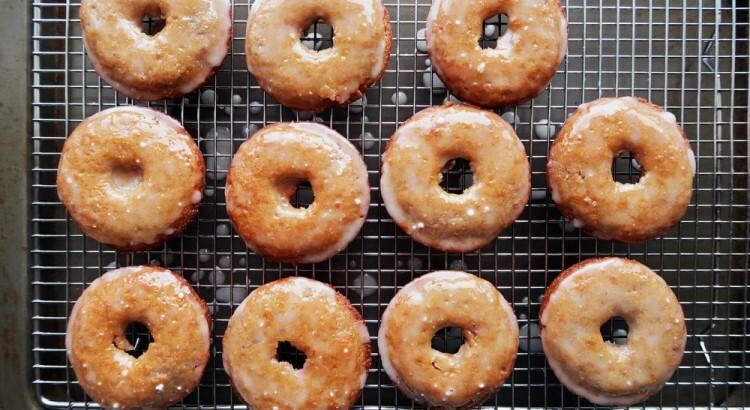 I’m talking about doughnut bouquets. Yep. You heard right. Weddings are entirely individual, and many ‘traditions’ that were once seen as essential to a beautiful wedding, are now quite easily substituted to better suit the pair who are aiming to create a memorable day. 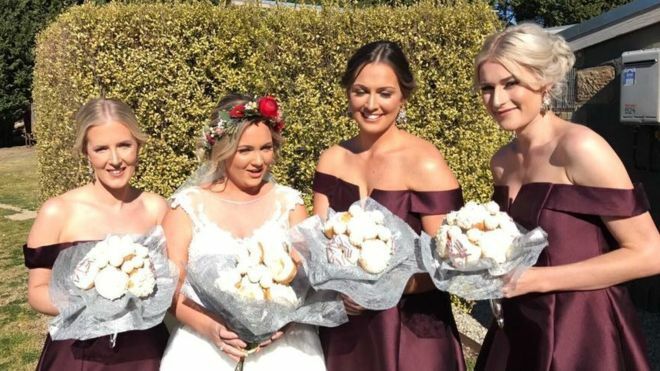 “We wanted the wedding to be a bit different and really reflect who we are as a couple,” Paige Burgess said of choosing her doughnut bouquets. Her groom Steve even wore doughnut cuff-links! Dessert Boxes owner, Samantha Khater says that it was all started as a social media based competition, where Paige was one of thousands of comments. Khater rang a few of the entrants before speaking with Paige and knowing she was the right girl for them. 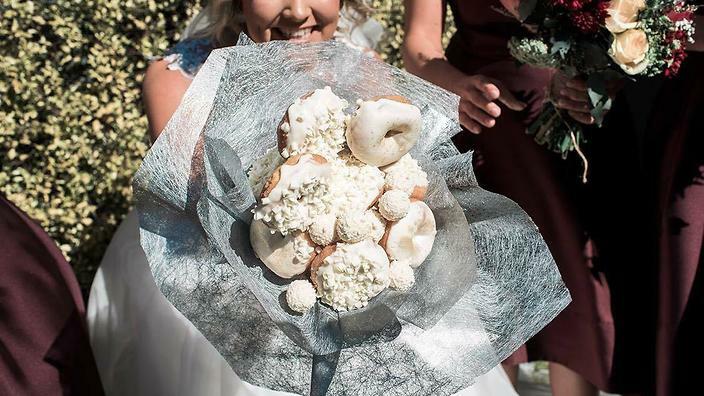 People’s response to the doughnut bouquets has been HUGE with brides-to-be inquiring about the doughnut bouquets which are currently not part of Dessert Boxes standard range. It is not the first time that we have seen couples play around with traditional wedding details to suit their personalities and tastes. Over the years, many have shunned the traditional wedding (fruit) cake in favour of other popular cake choices. Or the cake has been omitted altogether in favour of a what has been dubbed a “Cheese- Cake”; not the New York baked variety, but instead a tiered display of delicious gourmet cheeses, adorned with fresh and dried fruits. And for several years now we have been able to send chocolate bouquets as gifts. As a flower lover, I saw fresh flowers as an essential ingredient in my wedding day, but I know that everyone is different, and details I see as important may be insignificant to you. 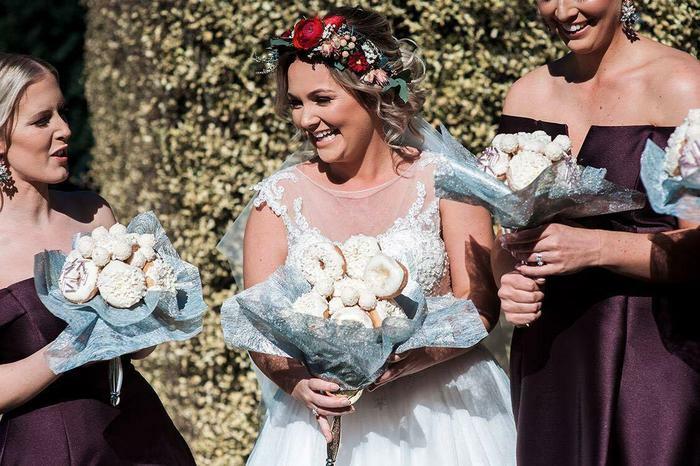 Would you consider edible bouquets for your wedding day?